Yesterday we were very pleased to welcome the BSO’s Artist in Residence Johannes Moser to meet and play with our Senior VSO group. 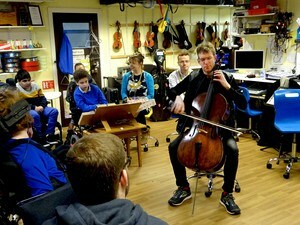 Johannes is a cellist and he brought his 320 year old cello to play. We shared Symphony 125 with him and he played us the first movement from Bach’s Cello Suite No 1 in G major. We then all played together using Mars from Holst’s planet suite as our starting point and inspiration. Fantastic!